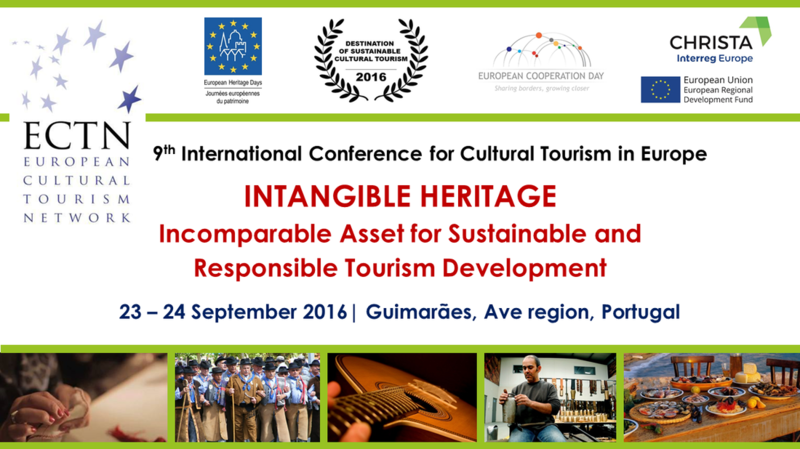 The 9th international conference for Cultural Tourism in Europe took place in Guimaraes, Portugal on 23 – 24 September 2016, on the theme ‘Intangible Heritage: Incomparable Asset for Sustainable and Responsible Tourism Development’. The conference was held within the framework of Interreg Europe project CHRISTA (Culture and Heritage for Responsible, Innovative and Sustainable Tourism Actions), which started in April 2016 for 4 years, including Intangible Heritage as one of four priority themes. This Conference on 23 September at the ‘Platform for Arts and Creativity’centre in Guimaraes, discussed the latest trends in the field of intangible heritage, including innovation, creativity, design, Research & Development and sustainable and responsible tourism product development. Keynote speakers were: the Vice-Chair of the Commission for Natural Resources, Committee of the Regions, Mr. Anthony Buchanan who spoke about ‘Tourism as a Driving Force’; Council member of Europa Nostra, Prof. Konraad Van Balen who presented the study ‘Cultural Heritage Counts for Europe’; representative of the European Travel Commission Ms. Iulia Niculica, presented ‘The European Tourism Manifest for Growth & Jobs’; and the Chair of NECSTouR Working Group Cultural Tourism and Cultural Sustainability, Mr. Jose Luis Maestro Castineiras, who presented good practices in NECSTouR regions. The conference was addressed by video messages from Claudia Tapardel, Member of the European Parliament, Co-chair of the Intergroup for European Tourism Development, European Parliament Committee on Transport & Tourism Member and Carlo Corazza, European Commission, DG Growth, Head of the Tourism, Emerging and Creative Industries Unit. The Director of European Institute of Cultural Routes/Council of Europe Dr. Stefano Dominioni made live intervention online. Through a ‘Call for Presenters’, 20 presentations have been selected in the programme coming from 11 countries. Presentations were made by 9 destinations, 12 universities and 3 consultancies. They showcased relevant experience, shared best practices, methods and concepts of successful implementation and provided practical recommendations to preserving, deploying and promoting intangible heritage for responsible and sustainable tourism development. The Conference concluded with a debate on the potential of intangible heritage for innovative, sustainable and responsible tourism development. During this Conference there was a ceremony of the ECTN Award prize for ‘Destination of Sustainable Cultural Tourism 2016” on the theme ‘Intangible Heritage Tourism’. There were 23 candidates for the Award coming from 9 countries across Europe. The conference programme was enriched with a Study Tour in Ave region on the next day 24 September, which included visits to Guimaraes “Oficina” (traditional Needlework and “Lovers Pottery”, the railway museum of Arco de Baúlhe and the Tamancos exhibition, to Casa da Lã - Bucos – Cabeceiras de Basto – project for the development of traditional wool craft and demonstrations of Luta do Pau - Bucos – Cabeceiras de Basto (traditional stick fight). There will be no fees for selected presenters attending the Conference. Participants, including selected presenters will have to make their own arrangements for travel and accommodation. The ECTN cannot cover travel costs, but most meals will be provided. Abstracts and presentations accepted by the Programme Committee of the Conference will be published online with author`s approval. A post-conference study tour in the Ave region is being planned. The award ceremony of the ECTN prize for ‘Destination of Sustainable Cultural Tourism 2016’ on the theme of ‘Intangible Heritage Tourism’ will take place during the Conference. Guimarães is a northern Portugese city, one of the country's most important historical cities and the ‘cradle of the Portuguese nation’. Its historical center is a UNESCO World Heritage Site, making it one of the largest tourist centers in the region. Guimarães was the European Capital of Culture in 2012. The Conference venue: PLATAFORMA DAS ARTES E DA CRIATIVIDADE, Avenida Conde de Margaride 175, 4810-535 Guimarães. The hotel is next to a cycling road - 14,1 km through a nice landscape, far from the center (6 km), transfer at fixed hours; breakfast included in the room rate. Price per room 40 €. Breakfast 6 € per person.